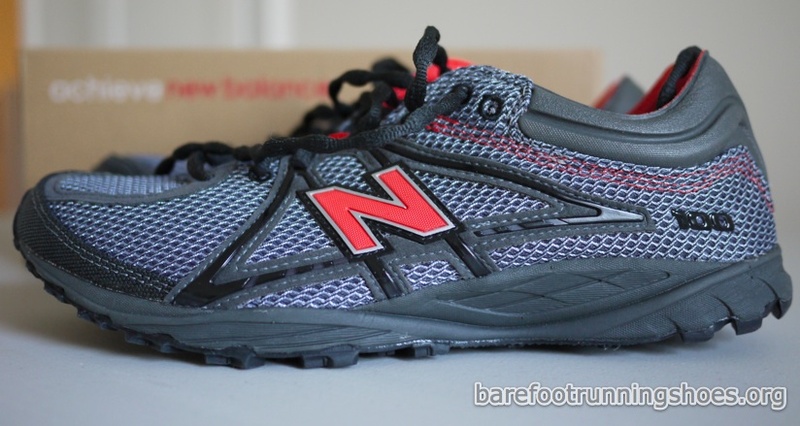 Like we mentioned in our first impressions of the New Balance 100 shoes we were very fortunate to have New Balance send us a pair of MT100’s to allow us to review. Now that is’ been a few months and I’ve been able to spend some significant time with these shoes we thought it’d be good to give you guys are “official” look into these shoes. For those of you who aren’t familiar with the New Balance 100 (MT100 is mens, WT100 is womens) line of shoes these are their off-road trail-running, minimalist shoes. I know that’s a mouthful, so I really like to think of these as an off-road barefoot running shoe. Something where you could technically run with your Five Fingers with, but honestly wouldn’t since your foot would probably be in so much pain you wouldn’t get that far. It’s great to see that since New Balance declared that there was validity in the barefoot running movement that they’ve dedicated resources to developing shoes that follow this philosophy. The New Balance 100 and its successor the New Balance 101 are all consequences of that decision. Out of the box I really liked these shoes. While maybe not as fashion forward as some of the Nike Free shoes, I liked the simplicity and “earthiness” look to these shoes. I’m color blind, so I can’t really speak too much as to the color choices, but I know don’t mind them and they seem to match my jeans just alright. Build quality of these shoes are really good as you would expect from a company like New Balance. What is deceiving about these shoes especially if you were just to look at the pictures is just how light these shoes are. it looks like a traditional shoe, but it’s much lighter than you would expect. I wouldn’t say it’s as light as the Nike Free 5.0 v4 or Vibram Classics that I own, but it comes pretty close (and remember this shoe is designed for off road trail running). The back of the shoe is made with this kind of foam like/cardboard type material that has some flexibility, but also supports and maintains the overall shape of the shoe. The outer part of the shoe is made with a breathable light plastic mesh material. It’s kind of trippy since if you hold the shoe up to the light it let’s light through as it’s semi-translucent. The other part that I thought was cool are the shoelaces. At first I thought there was something wrong with the shoes since they were all kind wavy and scrunched up. But then I discovered that that was done on purpose and is what New Balance calls their “Sure Lace” shoe laces. It’s shaped all bubbly to help prevent your shoelaces from becoming untied. I was a little skeptical how well these shoes would do while running in them. From the outside it looked like a normal running shoe. But yet again I was reminded by life’s humble less that you can’t judge a book by its cover. The first thing I noticed while running in these shoes is actually how flat these shoes are. It’s kind of deceptive but it’s actually relatively easy to run with a flat foot strike or mid-foot strike in these shoes After taking another look at the design if you look inside the shoe you’ll see that the heel is not as raised high as other running shoes which allows the foot to be relatively flat on the ground. Contrast this with the Nike Free 5.0 and it’s definitely no comparison when it comes to trying to run with a more flat footed gait. The Nike free has a much higher heel when compared to the New Balance 100. I spent quite a few miles running in these shoes and it’s been quite the treat. I love the fact that I can focus on running more mid-foot / fore-foot strike in these shoes and i like the fact that there’s more padding than say Vibram FiveFingers Classic which allows me to runner for longer and slightly faster (since the shoe minimizes the impact of the hard concrete, which I normally run on). While I really like the shoe there were some small issues that I did have with the shoe. Just like the Nike Free, the New Balance 100 shoes claim that you can wear them without socks. Thanks to the breathable outer layer it’s supposed to help keep your feet dry. In theory this makes sense, but in practice your feet will still sweat (I did at least). 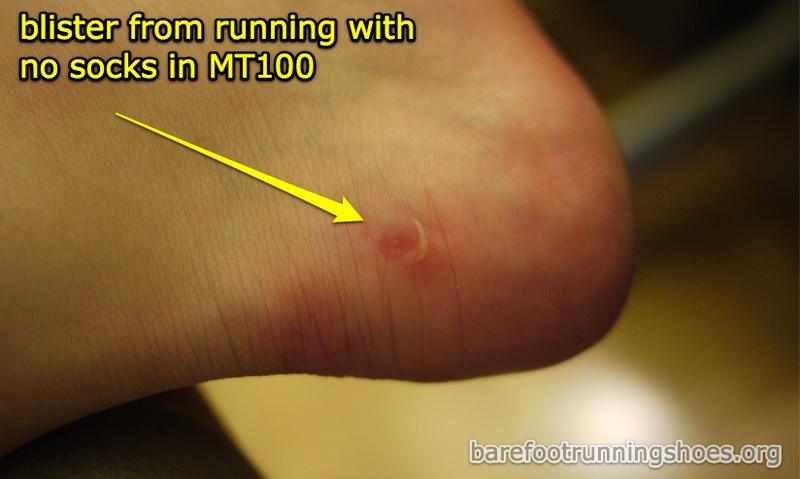 The bigger issue, though, is that I gave myself a nasty blister on the back of my heel. These were such a joy to run in that I probably over did it. I did like 3 miles without socks and came home to a blister. Partly to blame is the stiff back portion of the shoe. With socks, though, I haven’t had that many problems. The other minor issue others might have is the smell. I wore these shoes into work a few times and for 8 hours I smelled that chemical plastic smell. It’s not a very healthy smell (but again it wears off). I like these shoes a lot, actually more so than my Nike Free 5.0 shoes. Though not as flexible as the Nike Free, I like how they are more flat than them which in turn allow you to run more naturally barefoot-like. I like the look the and feel as well. Unfortunately if you are looking to get a pair that might be hard as many stores seem to be low in stock as they are clearing them out. Check out our shoe page for the MT100 (mens) and WT100 (womens) for places that sell them. Don’t despair if you can’t find a pair as the New Balance 101, the legitimate successor to the New Balance 100, are just around the corner. New Balance plans on selling these new shoes in October of 2010.
wow, those new balance shoes look pretty great, i really want to check them out… I’ve been wearing the frees for a while now and they’ve been pretty good .. I really enjoy how light the frees are.. feels like im slipping into a slipper .. the new balance’s look like that as well.. how do they feel.. and too bad about the blister, i guess you do have to wear some socks. 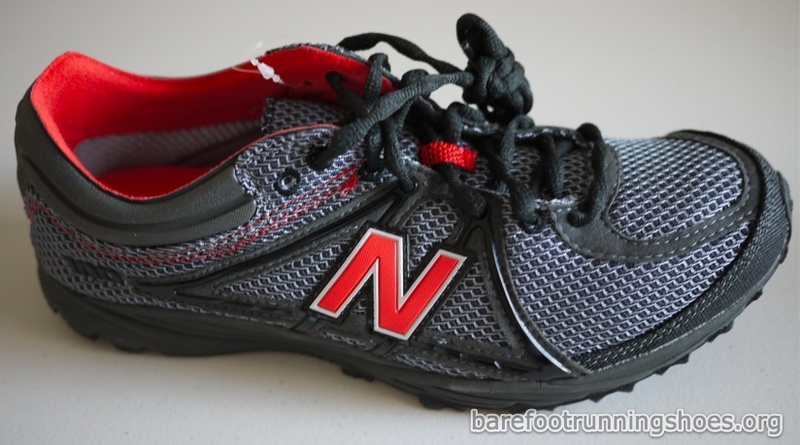 @jasonpatson, It’s actually funny, I started out with Nike Free and loved them…but after trying out these New Balance shoes…I love these even more. The blisters kind of sucked…but like you said socks fix that problem quickly (and honestly I wouldn’t make it a habit of running without socks…unless you don’t mind stinky feet). Overall, the feel is worth it. I especially like the flatter stance especially compared to the Nike Free…since the heel is lower to the ground. I actually own these shoes and love them, but the smell was overwhelming! My wife made me keep them in the garage, as they would pollute the entire shoe closet. It took about 5 months for the scent to subside. yup, the shoe’s is pretty potent…I couldn’t stand the smell at first, but after a while I kind of grew used to it. Sort of like the smell of gasoline. Next post: New Balance Minimus is Coming…FiveFingers Watch Out?